The best treatment or cure for a phobia is to slowly and gently come into contact with the thing that you are afraid of. Fear has wreaked havoc in this world and in our lives. We are afraid of so many things. We are afraid to face ourselves, we are afraid to love ourselves and some people are even afraid to like themselves. We are afraid of the beliefs of others, that they will attack our beliefs and our way of life. Defence is born out of fear and fear is born within the ego because as Napoleon Hill says “Fears are nothing more than a state of mind.” There is absolutely nothing wrong with fears that are rational, it is our irrational ones that do the damage. What we are mostly afraid of is uncertainty and the unknown and that is why when we face it, it becomes known to us, what we are actually afraid of is taken out of the equation and fear is diminished. When I was younger I had a totally irrational fear of fun fair rides, you couldn’t pay me to go on them. Eventually though, the fear of missing out grew bigger than my fear of the rides themselves so I slowly got a bit braver and started going on more and more. What I realised was once I went on the rides I absolutely loved them and I really couldn’t understand what I was afraid of! I have all my life had a huge fear of snakes. God only knows why or how taking into account that we have no snakes in Ireland but I must have taken on somebody else’s irrational fear somewhere along the way. While out on a school trip in London Zoo a few years ago, I had the opportunity to touch a snake. It took me a few minutes to build up to it but I did it! I touched the snake! Never in my life did I think I would go near it!! Then a year or two later on another school trip to Leahy’s farm, I actually let them put a snake around my neck!! 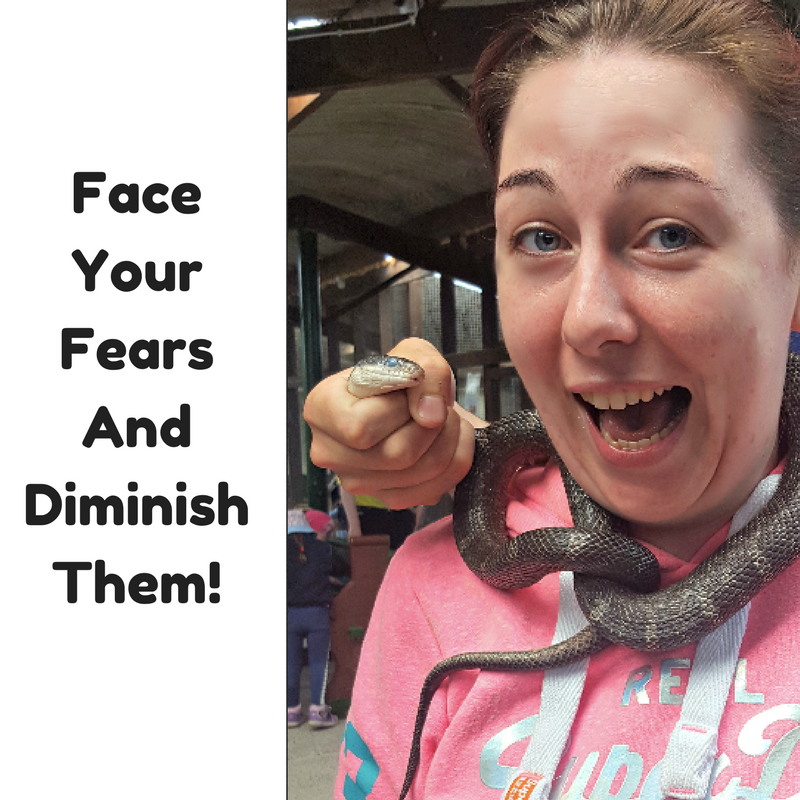 So it is possible to diminish your fears, you face the unknown one small step at a time! If people only realised this, instead of hiding, avoiding and brushing things under the carpet, our world would be a much better place! My advice to anybody now would be – Ask, seek, explore the unknown, don’t be afraid any longer! End the struggle with fear and embrace yourself as you are!